Travefy acquires Los Angeles-based TripScope as part of B2B growth strategy within the Travel Agent and Travel Advisor markets. 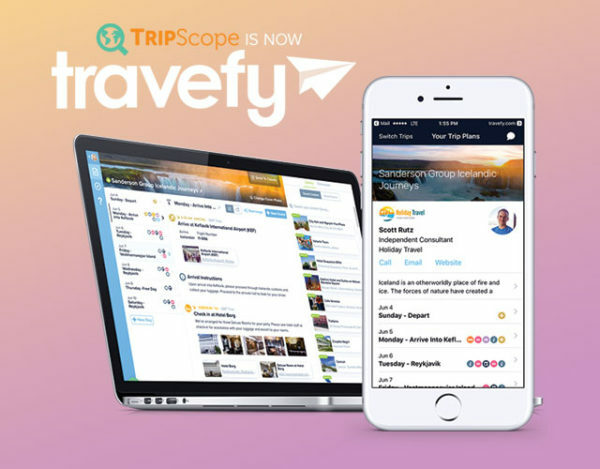 Travefy, an itinerary management and client communication platform for travel professionals, announced today it has acquired Los Angeles-based Travel Agent itinerary platform TripScope. Travefy’s flagship product – Travefy Professional – provides delightful itinerary management and client collaboration software for travel professionals and companies. Travefy powers over 1,000 travel businesses ranging from small, independent travel advisors to the largest travel organizations like Travel and Transport and the MAST Travel Network. As a platform, TripScope empowers travel agents to create, manage, and collaborate on digital itineraries delivering both direct connection and real-time data. TripScope was founded by Katelyn O’Shaughnessy in 2013 and has won numerous awards including Startup Finalist at Phocuswright 2014. “We’re excited for this next chapter of TripScope and believe Travefy is the perfect new home for our customers —all with world class customer service and support,” said O’Shaughnessy. Travefy acquired TripScope for an undisclosed sum and will transition TripScope accounts onto Travefy’s platform. Travefy builds delightful itinerary management and client collaboration software for travel professionals and companies. Travefy powers over 1,000 paid travel businesses ranging from small, independent travel advisors to the largest travel organizations like Travel and Transport and the Gifted Travel Network (GTN). Travefy has been featured in The New York Times, The Wall Street Journal and Forbes among other publications and has won numerous innovation awards including the Brand USA Marketing Innovation Award at Phocuswright 2015. Travefy is also a member of the Virtuoso Incubator Program. Travefy is headquartered in Lincoln, Nebraska with offices in Nebraska and New Jersey. For more information & press assets please see: https://travefy.com/press.